Board of Secondary Education Andhra Pradesh is announced the SSC annual final Examination test dates 2017. The AP government is decided to reduce the number of exam papers for Class 10th from 11 to nine from the 2017 academic year. That's way this AP SSC 2017 Public Examination tests will be conduct for only 9 Exams with New Syllabus and there is no Internal Marks linking for the final Examination tests. The Board of Secondary Education announced languages like Telugu, English, Hindi and Urdu will have only one paper, while subjects like Science, Social Studies and Mathematics will have two papers each. Paper-I for Science will comprise Biology, and Paper-II will deal with the physical sciences – Physics and Chemistry. Similarly, Social Studies Paper-I will have Geography and Economics, and Paper-II will feature History and Civics. The total marks will be 600, of which 480 will come from the final exams, and 120 through internal assessment. We have Provide the AP 10th Important Questions with Bit Bank for the Public Examination tests from the Board Previous Examination tests and New Syllabus Model Papers. 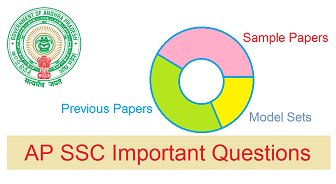 The Students Who have interested to Download Bit Questions and Important Questions to getting High Score of Marks in the AP SSC Public Exams 2017. The AP State Largest Educational Websites of Eenadu Pratibha and Sakshi Education also Provide the 10th Class Study Material, Booklets for IMP Questions with Short Answer Questions , Very Short Answer Questions and objective type Questions to Getting Good GPA Percentage in final Exam Results.